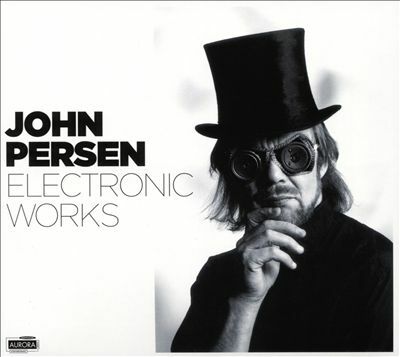 This set of two electronic works by Norwegian composer John Persen (1941-2014) focuses attention on a relatively little-known side of his work. His music for orchestra and chamber ensembles is well-represented on CD, while his opera Under Cross and Crown earned him a measure of renown. Persen’s biography is somewhat unusual, and in its own way its trajectory from an upbringing in a religious minority community to a career as a modern composer, is oddly reminiscent of La Monte Young’s own passage from Mormonism to musical innovation. Persen, of Sami background, was raised in an environment shaped by Laestadianism, a conservative Lutheran revival movement. He studied at the Oslo conservatory and pursued further studies in composition in Germany with Ligeti. In addition to his compositional work, he took an active role in establishing or working with various cultural institutions in Norway. One of the two pieces presented here has been issued previously, while the other appears for the first time. The first track is Things Take Time, a work originally conceived of as a six-hour, staggered-loop piece called Against Cold Winds. The track, structured as a long-period cycle, features an array of sounds—chiming metallic chirps and synthetic tintinnabulations—that stays more or less constant across various changes of texture. Almost halfway in a dully roaring, wind-like sound washes out the chiming sounds and the piece evolves into long, layered tones, eventually coming back around to the sounds at its beginning. The second track, Nota Bene—The Title Is a Lie, relies on sounds that, while mostly percussive, are interspersed with sounds broadly suggestive of environmental elements: Bubbling and dripping water, rustling wind and rattling leaves. A minor complaint: The CD jacket lists the tracks in the wrong order and attributes a date of composition for Note Bene at variance with the date given in the liner notes. None of this takes away from the sound of the music, which is absorbing. Nate Wooley will be taking Battle Pieces on the road in Europe with Ingrid Laubrock, Sylvie Courvoisier, and Matt Moran. Where “A Love Supreme” served as a finely wrought vessel for Coltrane’s spiritual yearning, “Ascension” was more like glimpsing the face of God directly, and many of Coltrane’s fans refused to follow him into this daunting realm. Leave it to Rova, the long-running Bay Area saxophone quartet featuring Steve Adams, Bruce Ackley, Jon Raskin and Larry Ochs, to put their own stamp on this marvelously unruly music. Their new release, “Rova Channeling Coltrane,” is a three-disc set with a CD, DVD and Blu-ray of the 12-piece Orkestrova performing “Electric Ascension” at the Guelph Jazz Festival in Ontario in 2012. The next installment of Wet Ink’s ongoing Portrait Concerts series will celebrate the work of Anthony Braxton, a major figure of American music, on the occasion of his 70th birthday. Through lushly arranged electric art song and swirling computer graphic animation, The Knells and software artist Joshue Ott explore the personal and eternal questions that confound the human search for meaning and significance in the universe. In service of this overarching theme, the artists confront such specific ideas as one’s perception of the passage of time, the illusive nature of progress, the power of perspective in deriving meaning from one’s own life experience, and the circular and ultimately transcendental — if frequently violent — beauty of nature. The Baryshnikov Arts Center (BAC) will present the world premiere live performances of Daniel Wohl’s Holographic, performed by Mantra Percussion and the Holographic String Quartet with Daniel Wohl on electronics. Andy Kozar presents new music for trumpet at Spectrum. Flutist Martha Cargo, and Violin, Viola duo And/Play team up for a double bill of music for both instrumentation as well as a trio piece. The Crossing and PRISM Quartet perform the NY premiere of The Fifth Century, a large-scale work for the rare combination of choir and saxophone quartet by the English composer Gavin Bryars. Jeffrey Zeigler returns to National Sawdust with a program of new works for solo cello, which includes two world premiers by Brooklyn based composers Jim Thirlwell and The National’s Bryce Dessner. Zeigler will also perform the New York premiere of Tangled in Plastic Currents by Derek Charke. To honor Arvo Pärt, the Mannes School of Music at the New School, the New York Choral Society, and the Arvo Pärt Project have designated Sunday, January 24, 2016 Arvo Pärt Day. Open to the public with free admission, celebratory events are scheduled to take place from 1 p.m. to 5:15 p.m. In honor of the centenary of Milton Babbitt’s birth, Augustus Arnone will be performing the complete solo piano works of the iconoclastic and pioneering American serialist over the course of three piano recitals at Spectrum, New York City. The concert will highlight Yale’s brass faculty as well as the contributions to the brass repertoire of past and present Yale composers. The program honors the late composers Ezra Laderman and Gunther Schuller, both of whom served on the Yale faculty. NUNC performs a sextet by Argentinean composer Diego Tedesco, a work for voice and string trio by Jonathan Dawe, the New York premiere of an octet for strings by David Fulmer, Elliott Carter’s Four Lauds, Michael Jarrell’s Eco III, and Iannis Xenakis’s Aroura. John Zorn premieres Commedia dell’arte, a suite of five miniatures inspired by the dell’arte characters Harlequin, Colombina, Scaramouche, Pulcinella, and Pierrot.